The mission, led by Dr. Andy Wheeler of University College, Cork (UCC), will be investigating life at 3,000 metres below the surface of the sea on the ‘45o North MAR hydrothermal vent field’ using the Remotely Operated Vehicle (ROV) Holland 1. These vents, which spew mineral rich seawater heated to boiling point by volcanic material in the earth’s crust below, are home to a rich variety of marine life that thrives in complete darkness on bacteria fed by chemicals. Patrick Collins from NUI Galway’s Ryan Institute will lead Ireland's marine biological team investigating this unique ecosystem, which could tell us not only about how life might have evolved on other planets, but may also be a rich source of new biochemical processes with valuable medical and industrial applications. Another objective of the mission is to investigate the rich deposits of deepwater corals on the Porcupine Bank’s ‘Moira Mound’, which has already been designated as a Special Area of Conservation. These corals, which are very delicate and grow extremely slowly, are highly susceptible to damage by deepwater trawling and mineral dredging operations. 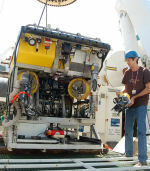 Dr. Andy Wheeler, Chief Scientist of the Expedition, is a veteran of four previous ROV surveys to coldwater coral mounds. 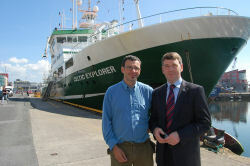 This mission is supported by the Marine Institute under the 2011 Ship-Time Programme of the National Development Plan. “This project is a perfect example of how strategic funding can pump-prime world-class marine research led from Ireland into new and exciting areas with tremendous potential for future sustainable development,” said Dr. Peter Heffernan, Chief Executive of the Marine Institute. The research is also supported by the National Geographic Society. 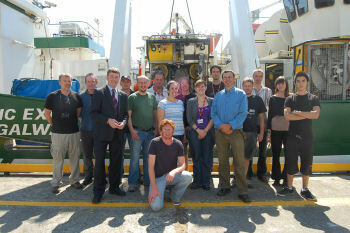 The mission carries geochemists, marine biologists, marine geologists, marine geneticists and technicians from Ireland and the UK as well as a three-person TV crew from National Geographic. They will spend 25 days at sea and will be posting a regular blog here on Blogger. Undiscovered ‘alien’ life forms that thrive without sunlight in temperatures approaching boiling point may soon come to light thanks to a groundbreaking Irish-led marine research mission aboard the national research vessel RV Celtic Explorer which set sail from Galway, Ireland yesterday (Wednesday 13th July). The voyage is being filmed for the National Geographic Channel for inclusion in an upcoming series about the ocean.